If you suffer from allergies or any number of respiratory ailments, such as asthma, spring doubtlessly puts added pressure on your lungs. You’ve probably searched high and low for remedies to relieve the misery on your nose, throat, and lungs. As a result, you’re likely also aware of the top pharmaceutical medications advertised on television, billboards, radio, and pretty well any other media outlet throughout the spring season. But are you aware of the countless other, natural ways to provide your lungs with relief that don’t involve over-the-counter medications? Here are the top seven herbs to help you fight respiratory ailments naturally. This herb is excellent for cleaning mucus from the lungs and bronchial tubes. Additionally, if you’re suffering from a cough due to allergies or even a late cold, coltsfoot (known scientifically as Tussilago farfara) soothes the lungs and mucous membranes. It is also good to take if you are suffering from any number of respiratory ailments, such as bronchitis, whooping cough, and emphysema. For respiratory relief, either steep two teaspoons for 15 minutes for a tea, or use one teaspoon three times a day in tincture form. It is important to note that recent findings may suggest coltsfoot could be toxic if taken for a prolonged period; due to its undefined safety classification from the Food and Drug Administration, it is best to take this herb in lower doses for just a short period of time. If you’re looking to kill bacteria, elecampane (Inula helenium) lessens coughs and expels excess mucus from the lungs. If you’re suffering from any respiratory ailments, this herb alleviates fever and causes the body to excrete any toxins through sweating. Mix one teaspoon of the herb in a cup of tea or take up to one teaspoon in tincture form three times a day. Due to its minor use to bring on menstruation, pregnant women should avoid this herb. While most prefer candies made from this herb, the dried leaves have the best medicinal properties. Horehound relaxes the lungs and encourages the discharge of mucus. Combine it with coltsfoot, mullein, and lobelia for an effective expectorant. Take one teaspoon of the herb in water or up to half a teaspoon of tincture three times a day. Black horehound is best avoided by those who are pregnant or breastfeeding or those suffering from a psychotic disorder. Lobelia is an excellent remedy if you’re suffering from any number of respiratory ailments, such as coughs, infections, asthma, and/or excess phlegm. If you’re suffering from bronchial spasms, it can also alleviate the symptoms, which is excellent for anyone suffering from asthma. Because this is an extremely strong herb, you must follow the instructions on the packaging carefully. Using lungwort helps to clear catarrh, an inflammation of the mucous membrane of the lungs, nose, and throat, and lessens a cough. It can be combined with lobelia, black horehound, and coltsfoot for an effective way to treat lung infections. Drink one to two teaspoons in an infusion three times a day. Alternately, you can take a quarter to one teaspoon in a tincture three times a day. Infusions and tinctures made with mullein are effective for clearing the respiratory tract, as well as clearing excess mucus from the lungs. It’s also effective for treating coughs and sore throats. Use one to two teaspoons in an infusion in one cup of water three times a day. Alternately, you can use mullein in a tincture with a quarter to one teaspoon of the herb three times a day. In addition to being an effective treatment for lung disorders, asthma, and coughs, sea buckthorn is a little-known superfood that is also an effective treatment for skin conditions; there is even evidence that it can be used to treat cancer and weight loss. The plant’s berries are also used in foods, including jellies, juices, and sauces. Before you use any of these herbal methods to treat any ailments affecting your lungs, please consult with your physician first, especially if you are pregnant, breastfeeding, have a known history of mental illness, are prone to blood clots, or take any prescription medications. Schoffro Cook, M., “7 Natural Lung Healing Remedies,” Care2 web site, September 27, 2013; http://www.care2.com/greenliving/7-natural-lung-healing-remedies.html. 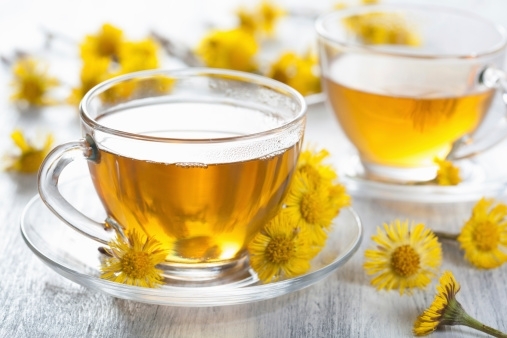 “Coltsfoot Uses, Benefits & Side Effects,” Drugs.com Herbal Database web site; http://www.drugs.com/npc/coltsfoot.html, last accessed May 5, 2014. Castleman, M. and Saul Hendler, S., The Healing Herbs: The Ultimate Guide to the Curative Power of Nature’s Medicines (Random House, New York; 1991), 225–228.